LFC3033, 14 Nov 2011Nokia should stop making smart phones they lack in the quality...this phone is the worst thing... moreTake a look at this videos, it teach you how to think about Nokia? and how Nokia thinking? Therefore should not be compared between Nokia and Samsung, LG etc. Can anybody tell is there English dictionary application in this cell phone? Even in some phones that can be customized animated background for the main screen can consume nearly 15% of battery life, etc. As for the regular use of the Nokia 700 battery last for my use in the average day and a half of day. kentang, 12 Nov 2011Can Nokia 700 do video call?i believe it can but without front camera the person called will not be able to see the caller using Nokia 700. Anonymous, 06 Nov 2011yaay.....got my hands on this device a few hours ago......its sweeet....belle works smoother n... moreHello nsrmdn,pls, can you tell us about the battery life? Archie, 11 Nov 2011Love this phone, though battery life kinda sux, and the keypad for messaging is too small - if... moreI love this phone too. I have decided to buy it, but, the battery issue is discouraging me. pls, does it last for a day in a normal use? 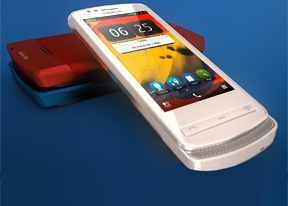 Can Nokia 700 do video call? Love this phone, though battery life kinda sux, and the keypad for messaging is too small - if it had the same size keypad as the N8 it would be totally the best handset ever. Does this phone have a hole for a wrist strap? Total of 1710 user reviews and opinions for Nokia 700.